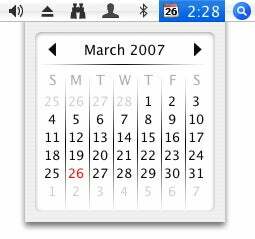 Over in the Macworld forums , a reader recently asked a common question that can be paraphrased as, “How can I get Mac OS X to put the date , in addition to the time, in the menu bar?" You can actually do this with some tinkering in the Formats tab of the International pane of System Preferences: First you click on the Customize button in the Dates section and then configure your preferred date format; select that format and copy it to the Clipboard (Edit: Copy). Cancel out of that dialog and then click on Customize in the Times section; choose Medium from the Show pop-up menu and then paste (Edit: Paste) your date format into the time format field. Assuming you’ve enabled, in the Date & Time pane of System Preferences, the option to show the date and time in the menu bar, that display will now include the date! But that process is a kludge. A clever kludge that works, but a kludge nonetheless. I personally prefer to use one of the myriad utilities out there that let you easily add the date to the menu bar and also give you additional features. I’ve covered a couple shareware products myself in the past, and in the forums thread noted above, fellow Macworld readers suggested a number of others. However, one that wasn’t mentioned, but is definitely worth a look, is Charcoal Design’s MagiCal 1.0.9r1 ( ; payment requested). Launch MagiCal and the first thing you’ll notice (besides the fact that you likely now have two clocks in the menu bar—you’ll need to turn OS X’s own off) is that you’ve got the time and a small calendar icon displaying today’s date. 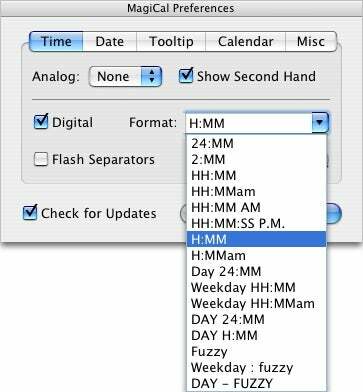 Click on the time or date and you’ll see a nifty, drop-down calendar; you can switch months by clicking the left or right arrow, or by clicking on the month or year, each of which provides a pop-up menu for quickly switching to a given month or year, respectively. But that’s just the default display; via MagiCal’s preferences dialog, you can customize many aspects of MagiCal’s appearance. For example, you can choose between a digital or analog time display; choose the display font, color, and size; and choose the time format from among 16 options (or even create your own format). You can similarly customize the date display, choosing between calendar-icon graphics or a textual display, with format and font options for the latter. Other options include a floating tooltip that shows the date and time—again, in the format you choose—whenever you hover the mouse cursor over the MagiCal display in the menu bar; and the ability to force MagiCal’s display to be positioned on the very right or left side of the menu-extra area of the menu bar. 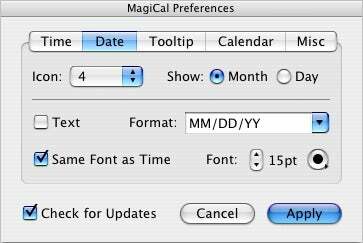 Finally, one other useful feature is the ability to drag MagiCal’s drop-down calendar off the menu bar and position it anywhere on your screen, where it will stay until you close it. A setting in the preferences dialog lets you choose whether the calendar acts like a palette (floating above all other windows) or part of the Desktop (sitting behind all other windows). MagiCal is a nifty way to customize your menu bar’s date and time display far beyond what Mac OS X’s own functionality will allow. Although there are a few similar utilities out there that provide more features than MagiCal, most are shareware or commercial software. Free is tough to beat (although if you find MagiCal useful, I encourage you to send the developer a donation, through the link on the MagiCal Web site, to encourage future development). 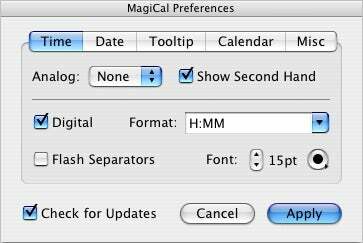 MagiCal requires Mac OS X 10.3 or later and is a Universal binary.